A dozen long-stem roses wasn’t enough for one man on Valentine’s Day. 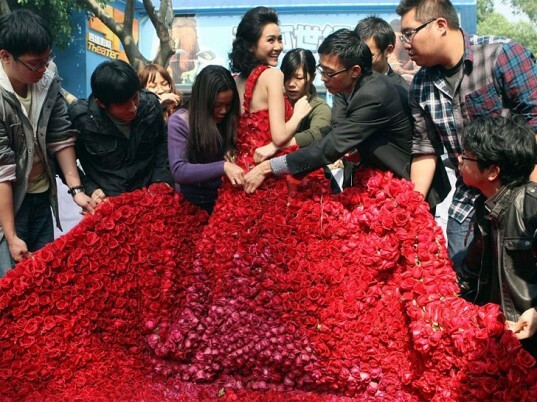 Xiao Fan opted for a wallet-stretching 9,999, which he fashioned into a lavish gown before proposing to his girlfriend, Yin Mi, at the Guangzhou amusement park where they met three years ago. (Yin had just been crowned Miss Bikini 2009 when they first locked gazes.) Dressmakers toiled unceasingly to create the remarkable garment, which includes delicate rose-petal shoulder straps and a sweeping five-foot train made from individually stitched blooms. The number nine is significant to the Chinese because it’s a homophone of “long-lasting,” which has auspicious connotations for weddings. According to legend, the number 10,000 was reserved only for deities. The emperor who commissioned the imperial palace in Beijing’s Forbidden City was said to have requested 9,999 rooms, believing that the number brought him closest to heaven without aspiring to rise above it. 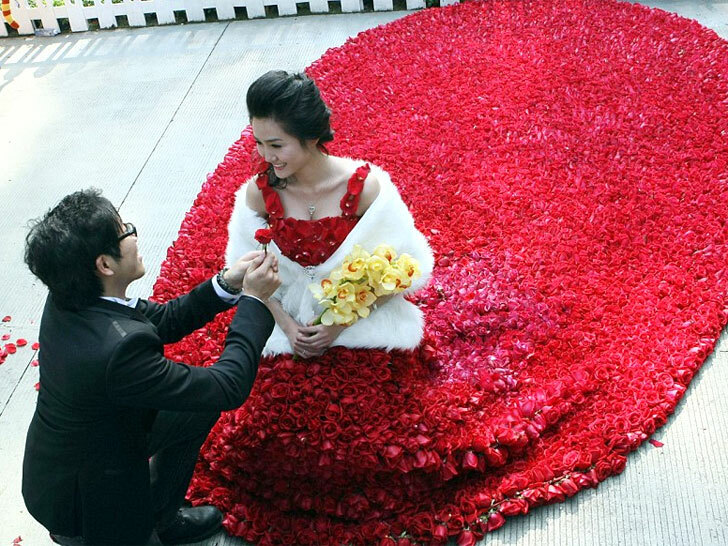 Yin paired the dress with a white shrug and a bouquet of yellow orchids, which symbolize love, beauty, and fertility. And, judging from that massive rock on her ring finger, she said yes.